How could anyone not fall in love with the cute, adorable furry face of these golden retriever puppies? Not to mention that furiously wagging little tail. They are always so playful and willing to cuddle and play. These are the common traits that most new dog owners hope to see when seeking a puppy. With a life expectancy of up to fourteen years though, it is a lifelong commitment adopting a golden retriever puppy. Such an important decision should not be taken lightly nor, made on impulse. Popular breeds like goldens may be found in pet stores but it is generally not recommended to purchase a puppy this way. A disadvantage to buying a puppy from a pet store is that you are not able to see the parents of the puppy you are purchasing. As in humans, parental traits are usually passed down to their puppies. A puppy from a mild mannered, friendly dog will most likely produce a calm, friendly adult too. A dog with an aggressive nature will most likely produce an aggressive heir when mature. Fortunately golden retrievers seldom have an aggressive character. If you are considering adopting a golden retriever puppy, make sure that you search out a good breeder in your area. It is considered best practice to adopt a new puppy from a breeder, and preferably one registered with the Kennel Club. Typically, private breeders who love this breed consider themselves experts. They can also offer their clients a lot of advice before and after they have taken their puppy home. Golden retriever puppies generally adhere to their breed standards typically being both intelligent and energetic. They are easily able to be trained with positive reinforcement and love to be rewarded with food and affection. Golden retriever puppies love to chew, so if you don’t to find you favourite pair of shoes one short or your chair with only three legs, you had better offer them their own toys to chew! Golden retriever puppies should also be kept busy when they are not resting because their highly intelligent and inquisitive nature may cause them to become bored. Left alone without activity or companionship, their boredom may turn into frustration and potential destruction. Attending an obedience class with your puppy will prove to be a wise choice for any dog owner. They are extremely willing to please their owners but can sometimes need direction in order to do so. 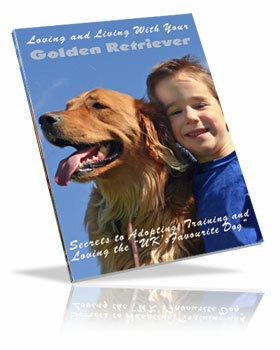 Golden retrievers of course love human companionship, children and other pets and make the ideal family dog. They love nothing more than to play fetch in the garden or go on long walks. Their highly energetic nature of these dogs allows them to be the perfect partner when jogging, hiking or hunting. They also tend to make perfect guide dogs, search and rescue dogs and other types of service dogs. Golden retriever puppies soon grow up to be a dog you will enjoy and can be proud of!